Blueberry crisp crumble with an oat and coconut oil topping. Healthy and fruity dessert that’s gluten-free and vegan. No added refined sugar! Two things I have an obsession with lately – blueberries and coconut oil. So I’m only surprised this recipe didn’t happen sooner. I didn’t know whether to call this a “crisp,” “cobbler,” or “crumble.” So I had to do some research. 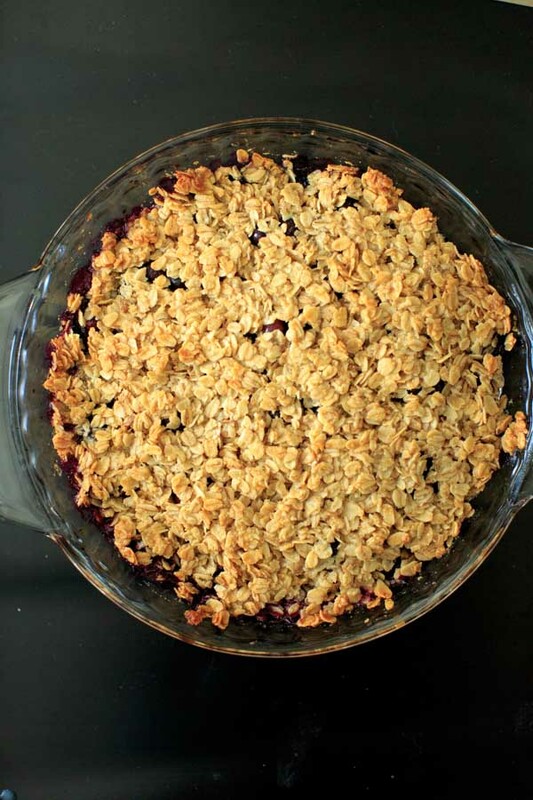 A crisp, or crumble, is fruit with a topping of some combination of flour, oats, nuts, butter, sugar. A cobbler is fruit topped with batter or biscuit crust, usually not entirely covering the fruit (like a cobblestone sidewalk). I also learned words such as “buckle” or “grunt” or “brown betty” but you can read about those here if you want. The things I learn while writing recipes never ceases to amaze me! Anyway, the problem with crisps or crumbles or whatever you want to call it, is a lot of time there seems to be a lot of added sugar. As per usual, I wanted to make a healthier version that wouldn’t sacrifice on flavor. Blueberries are already so sweet, so I didn’t miss the sugar. Though I won’t judge if you want to add more honey/maple syrup to sweeten, and/or serve the blueberry crisp crumble with some ice cream. I used oat flour for this recipe, but if you’re not trying to keep this gluten-free you can use regular flour. 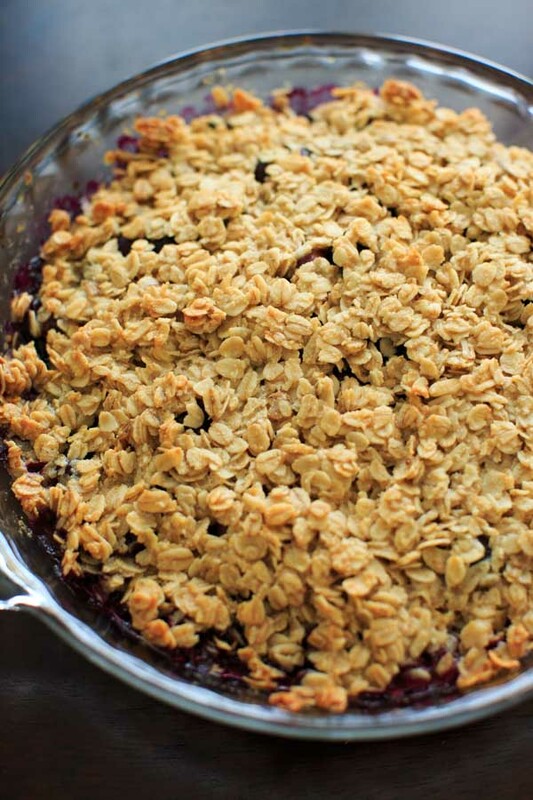 Blueberry crisp crumble with an oat and coconut oil topping. Healthy and fruity dessert that's gluten-free and vegan. No added (refined) sugar! 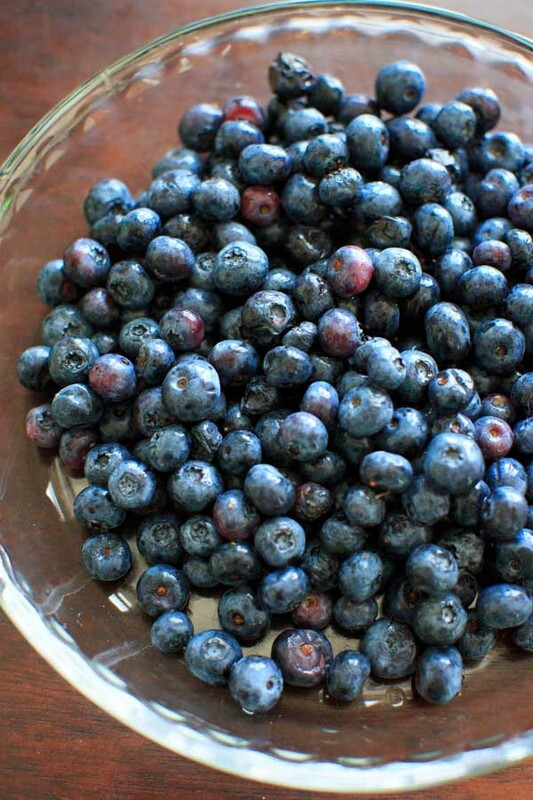 Rinse and dry the blueberries and place in a 9 inch baking pan. Squeeze lemon juice evenly over top and stir quickly. In a small bowl, combine oats, coconut oil, flour, honey or maple syrup, vanilla, cinnamon and salt. Evenly distribute oat mixture over top of blueberries. Bake for 30-40 minutes or until oat topping is lightly browned. *There are links within this post that we can earn a commission on at no extra cost to you (known as affiliate links). Thank you for helping to support the site! 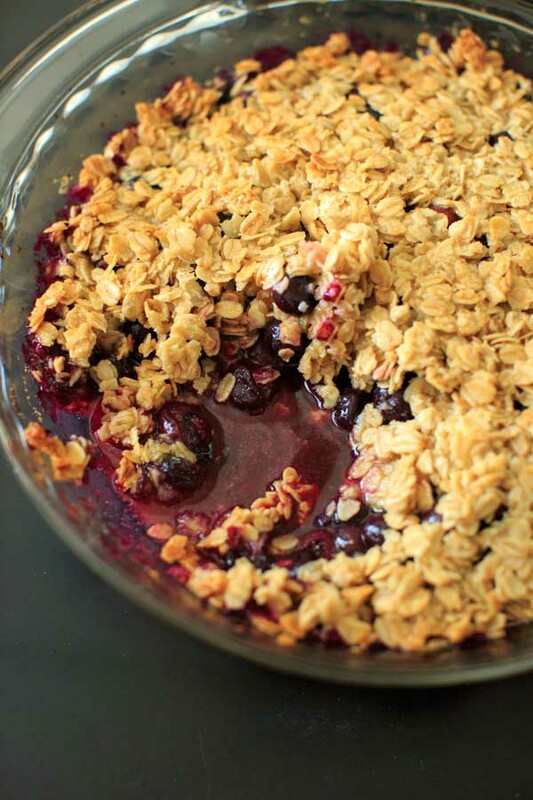 I love blueberries and crumbles, this recipe looks incredible! What a wonderful recipe!! I made it tonight and I have to say it’s the best blueberry crisp I’ve ever had. The topping is super-crunchy yet very light and the whole thing is just delicious. Perfect level of sweetness too. Wonderful!! Thank you so much. So glad to hear that Marina! Cue the angels!!!! This looks heavenly! I’ve got coconut oil and blueberries in the pantry so it seems I need to get busy! Lisa, you made my day! Hope you love it! This looks so good!! Love a good crumble on top! This is how I make my crumbles and crisps too. The coconut oil makes it really moist. Ha haa I love this! 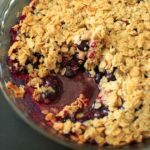 I had the same dilemma about what to call a recipe I did with cherries last year, I went for Crumble Crisp against your Crisp Crumble! High five, great minds!!! Love the look of the dish too, those blueberries look so juicy. This looks so good, can I use frozen blueberries? Hi Kindra! Using frozen berries can sometimes cause sogginess from the extra liquid, so I’d suggest rinsing and drying thoroughly if you’re going to try it. Hi! I’d like to make this recipe as dessert, but I need to keep it a couple of hours before eat it. What would you recommend? Can I keep it in the fridge and reheat it later? It’s best prepared if you can serve it right after baking. Coconut oil will harden when refrigerated so the consistency might change a little if you refrigerate and then re-heat. But sometimes you gotta do what you gotta do! Technically since there are no eggs or dairy (and since the lemon juice acts as a kind of natural preservative) it should be fine to leave at room temperature if it’s only for a couple hours, but I’m not a food safety expert 🙂 If it were me I would reheat in oven at 225°F for 15 minutes or so before serving (maybe a little longer if you end up refrigerating it beforehand). Hope this helps! I tried this recipe and did three tbl of syrup and sprinkled some sugar on top and it was still very tart. I would recommend tossing the berries in a little coconut sugar and maybe corn starch or flour if you’re serving to guests who are use to the sweeter palette. Even reducing the lemon juice would help. Timing was good and so was oven temp! This was delicious! I made a few changes and thought I’d add them here in case any others were curious! ~I used a combination of ground pecan and almonds– it lended for a richer, more complex taste. ~I had to up the flour+oats since the berries were more juicy. ~I made this recipe in its entirety the night before and let it sit in the oven. The next day I warmed it up and served it for breakfast. I didn’t have any trouble with the coconut oil hardening. I would add that it would be best served with some vanilla ice-cream; but is totally sufficient on it’s own as well! I had 4 children (8,6,4,&1) and they all loved it for breakfast. If it is too tart for your tastebuds, could sprinkle with some turbinado sugar on top. Thanks for this recipe! Enjoy! This is awesome! My cousin and I can’t have sugar, so this is a great alternative for delicious sweets! Thank you so much! Would rice crispys work instead of oatmeal? If you share a picture on any social media, just tag #trialandeater so I can see! So glad you enjoyed it and I love that you added all the colorful berries!